Barely a fortnight after announcing his presidential ambitions, Ugandan musician-turned-politician, Bobi Wine, is facing the threat of eviction from his Kampala business premises. Bobi Wine - real name Robert Kyagulanyi - grew up in the murky slums of Kamwokya and it's from there that he nicknamed himself the 'Ghetto President', while operating from the disputed land where he established Ssemakokiro Plaza music recording studios. 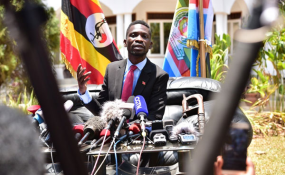 But now, the area landlord M/s Pearl Hope Investments Limited, through Lubega, Matovu and Company advocates, in a letter dated March 11, 2019, has notified Bobi Wine and others (in separate letters) about the planned eviction. The landlord has accused Bobi Wine and others of trespass and has consequently issued them with a seven-day eviction notice. "You went ahead and demolished the old premises thereon. You erected Ssemakokiro Plaza on the land wherein you have your recording studios and other activities. As you may appreciate, you are purely a trespasser on our client's land, our client on purely humanitarian grounds gives you a notice of seven days within which you should remove your developments as they constitute a nuisance therein," the letter addressed to the MP reads in part. Bobi Wine, who also serves as the Kyadondo East Member of Parliament, is yet to officially respond to these accusations but Ugandan media has quoted his younger brother stating that the singer owns the contested piece of land.